Just trying to raise everybody's blood pressure. Happy friday! But in all seriousness, the castle is not visible, even from areas of the hub. Trees and other foreground obstructions like ODVs and Rocks block a vast majority of it from view in many viewing locations. The argument that Disneyland's castle has to be small to fit the scale of disneyland doesn't make sense. I have heard it for a decade and I finally will explain why this is ridiculous. The castle in Paris is twice the height of Disneyland's. Orlando's is more than double. Their buildings, however, are not twice as tall as those on our main street. Their Main Street is not twice as wide as ours. The castle takes up roughly the same surface area on the ground at the end of the street, it just reaches higher into the sky so it is visible over people's heads and other obstructions like trees. Disneyland's castle is so small that if you stand in town square and draw lines down the building facades and the street toward the center to create one point perspective, it doesn't even push above the height of the street wall on main street. In the recent halloweentime commercial playing on cable tv right now, the castle has the same architecture, but has been CGI'd to make it more prominent in the shot. When standing at the back of fantasyland and looking toward the castle, Peter Pan's flight and Snow White's scary adventures facades dwarf it in the foreground. Some argue that it is to scale with matterhorn; are the other mountains in Disneyland and Castle parks around the globe subject to this same requirement? Space mountain, big thunder, splash mountain... none of these structures are expected to be taller than their respective castles, and many a space mountain are visible at the same time as their park's castles. It seems like an odd design decision that has been defended but actually doesn't do anything to benefit either participating structure. At the time of Disneyland's opening, the trees had not grown in and the castle functioned as an icon that oriented guests within the park. You could look at it and know how to get around the place. Every castle park has followed the hub spoke and wheel tradition, and the castles still function in this way, except for Disneyland's, which is no longer visible from within most of the park. So in this way, the castle is no longer performing its basic functions as it set out to on opening day. 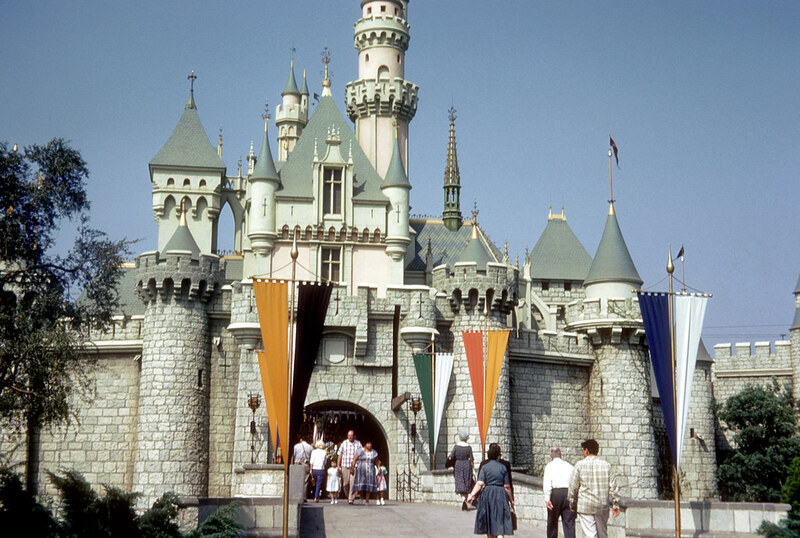 Finally, the original concept artist/designer for Disneyland's castle went on to make dramatic changes to its design, more dramatic than any other subtle changes made to the magic kingdom park, when they opened their second castle park in Orlando. I know, it is a really charming design. It is walt's original and many of us who grew up with the park would hate to see it go and don't trust the current imagineering teams to give it a superior replacement. However, I often feel like we are preserving the past in exchange for inferior show quality and guest experience. I live in hollywood, where spanish style and french chateau apartment buildings, hotels, and single family homes dot the landscape. Jim Henson's office on la brea blvd looks like fantasyland. The castle is of the same design style and scale as many homes around mid-city/wilshire, west LA, hollywood, Silver Lake, Los Feliz. I don't think anybody looking at the paris castle would equate it with single-family homes; there, it operates on the scale of iconic institutional architecture. 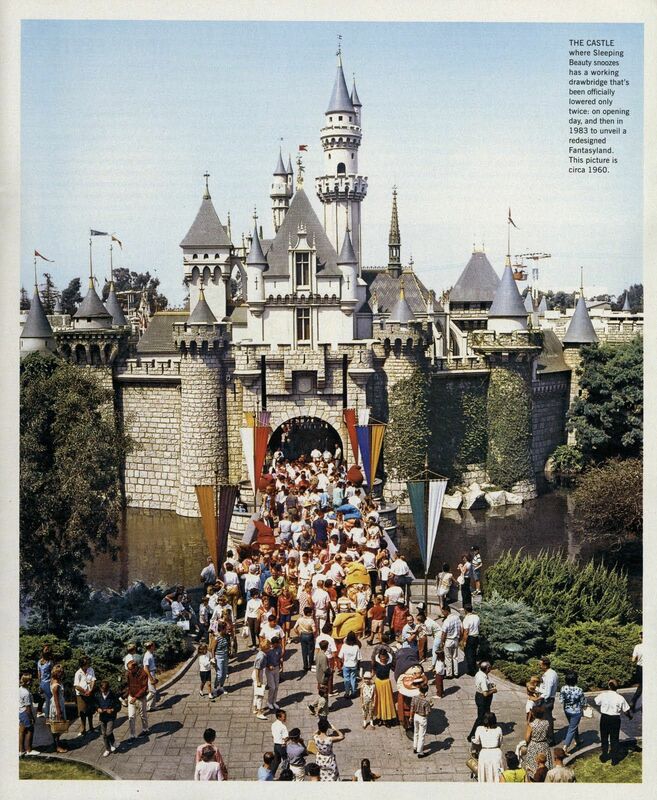 The castle was considered to be replaced in 1984 with Tony Baxter's new fantasyland, and ultimately they decided against it, but how different would the park be now had they gone through with it and the public embraced the new castle? Arguments against changing it because it is the original and too sacred are silly to me, when I consider that St. Peter's Basilica, the home of the Catholic Church, was relocated and rebuilt once, and then the current Vatican City location was added on to and modified by several architects for centuries. Sleeping Beauty Castle is more sacred than the capital of the Catholic Church now? Disneyland has become extremely crowded in recent years. Widening of midways is going on all over the park as well as the reconfiguring of queues for guest comfort. With a taller castle, we could create viewing areas for nighttime spectaculars in several lands, and do projections on the side and back for viewing from tomorrowland and fantasyland to better distribute crowds and ease congestion. Okay, I said my bit. Let's argue! Happy friday and don't forget to vote. Just take it out and put in the Death Star already. Delete this post right now. Maybe they can convert it into a museum-fortress-powerplant? I haven't heard any counter arguments yet. I must have made a good case, and everyone is just panicking at the thought! I would love to see a poll conducted at Disneyland on park guests, not on disneyland fanatics on this board. I think we would see a different balance of responses. Disneyland park guests are stupid. Even Walt thought so. I agree 100%. I think it should be some sort of warehouse fortress power plant design. Maybe change it to "Rocket Raccoon's castle"
Sleeping Beauty Castle is the original. It started it all. Leave it the heck alone. It's scaled perfectly for Disneyland Park, which is a park that has always favored quality and charm over size. Seriously, who the heck cares which fake fiberglass princess castle is the tallest? I mean, besides--apparently--HK. Interesting excerpt from this article that I felt applied to this discussion well: "He [Rolly Crump] points to the height difference between California’s Sleeping Beauty Castle (77 feet) and Florida’s Cinderella Castle as (189 feet) as an example of the change. “When you go to Disney World and you see the castle, you want to genuflect ... and that disturbed me.”"
Is this so triggering? I don't care about the tallest; but as I have laid out above, it is neither sacred nor fulfilling its functions. And in its current state, it isn't quality either. The roof and the facade walls are dented and cracked. Thank you for the link!! I would argue that Disneyland isn't dead. I might be arguing that to many of you in this poll, but last time I checked, NOS, adventureland, tiki room, jungle cruise, frontierland, fantasyland, and main street are still in tact. The only thing that is butchered is tomorrowland and it has been that way for 20 years. Wizard's Tower should've been Hong Kong's. The classic looks the best, though. It's so charming. “Soaring” and “Wizard’s Tower” are both really ugly. “Existing” all the way! Leave it the heck alone. Except it hasn't been left alone. It's been painted in garish colours and given superfluous "details" like the squirrel statues. Honestly, Sleeping Beauty Castle is perfect because it's not like all the others. If you want a huge, towering castle, go to... literally any other Disney castle park (as of the next few years for Hong Kong, at least). Walt Disney World's Magic Kingdom was meant to be a grander version of Disneyland, but that doesn't mean that Disneyland should be built up to the scale of Magic Kingdom. I literally see no reason why a bigger castle is necessary besides the you-know-what-measuring-contest going on between Hong Kong and Shanghai currently. I laid those out earlier, but I'll list them for ease. Trees and other foreground obstructions like ODVs and Rocks block a vast majority of it from view in many viewing locations. At the time of Disneyland's opening, the trees had not grown in and the castle functioned as an icon that oriented guests within the park. You could look at it and know how to get around the place. Every castle park has followed the hub spoke and wheel tradition, and the castles still function in this way, except for Disneyland's, which is no longer visible from within most of the park. So in this way, the castle is no longer performing its basic functions as it set out to on opening day. Why does the castle need to be big anyway? I care more about being able to enter the castle by drawbridge than how big it is compared to all the other castles. Adding height is money wasted that is better spent elsewhere. It looks larger in these images than it does today. Tree growth?